This is a story about my tough battered shoes. 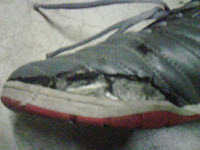 It started when my friend bought a futsal shoes which i think is quite cheap, RM70 or around that region. That's when i wanted a pair of my own. And so... i went bargain hunting and manage to get an Umbro futsal shoes at that price. I was very happy and a lil bit a confuse at that time, what was I buying them for? And soon, I joined all my friends for regular futsal sessions. At first, I was not too familiar with the shoes and miss kicks were one of my top skills. My footing was a lil bit off when i'm with shoes. Sessions after sessions things become better and i regained my usual footy capability. 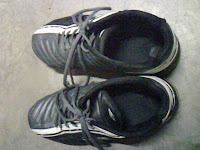 When i purchased these shoes, my goalkeeping skill was deteriorating. That's the time i adapt my goalkeeping shot stopping skill into a defender's anticipation. Throughout 3/4 years, I'm shifting towards an attacker and a more offensive player. Goalkeeper --> Defender --> Defensive Midfielder --> Winger --> Striker --> Winger. This is about how my position shift. Now... playing generally everywhere on the court. 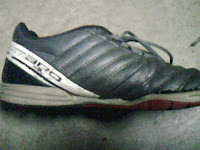 Been enjoying the regular futsal sessions until few weeks back when suddenly my shoes broke apart. Remember the previous post i had about the futsal game which i scored quite a number. That's the very last game they served me and yes... they served me well. From the condition of my shoes, you will know that my right foot is my dominant foot as there are way less damages on the left shoe. Both pictures are of the inside of my shoes. When they became what they have become, it really hurts my heart. Then... I started playing barefoot again. It was not like the old times, my foot hurt as i take shot. It's like barefoot is something i'm not familiar with although it's something somewhat the way i used to play. You will all get to see the latest addition in my futsal family in the coming post. I really love them very much. Wait patiently ya.